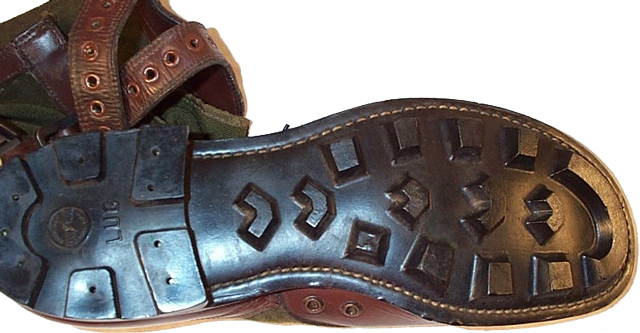 The tread pattern of the out-soles was various: from the most common lug sole design to the "Aigle"-type pattern of small round lugs resembling the hobnailed out-soles of American Model 1917 "Pershing" boots of WW I. 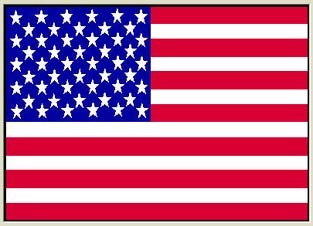 The identification information (such as date of production: April 4, 1952; NYQMPA (New York Quartermaster Procurement Agency) etc.) 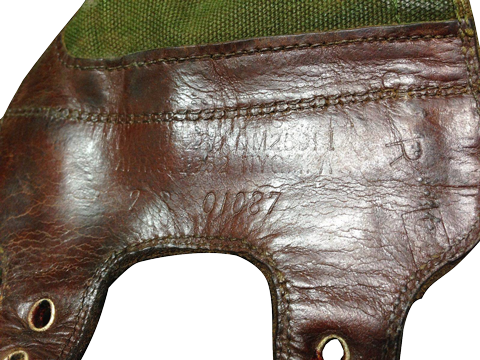 was hot-press stamped on the inner leather side of the 2-buckle fastener. "Tropical combat boots have nylon tops, leather over the toe and heel portions of the uppers, and cleated rubber soles. They protect the feet against insects, mud, rough ground, and undergrowth. 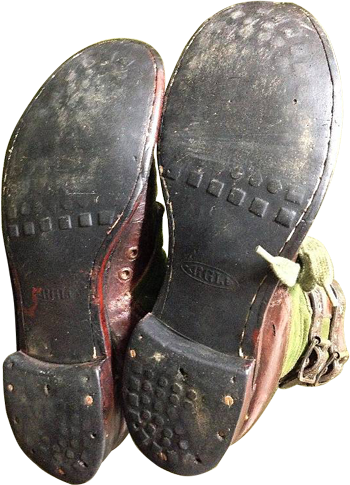 The cleated rubber soles are flexible, yet thick enough to protect the feet from stone bruises or other foot injury. They help prevent slipping on muddy and grassy slopes. 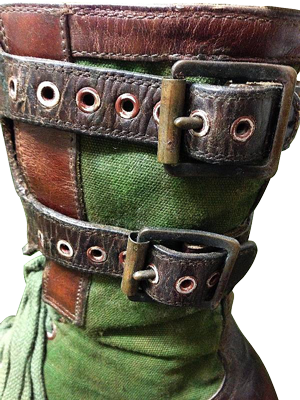 The boots have built-in screened eyelets, one at the inside shank of each boot. These eyelets permit air to reach the feet and allow water to drain out. a. Fit. Tropical combat boots come in whole and half sizes and in widths ranging from extra-narrow to extra-wide. For proper feet, the boots should be longer and wider than normal footwear to allow the usual swelling of the feet in hot weather and to accommodate the ventilating insoles worn with them. Note. Some temporary discomfort may be experienced when a change is made to tropical combat boots. This discomfort is caused by fatigue of the foot muscles. It is neither serious nor injurious. 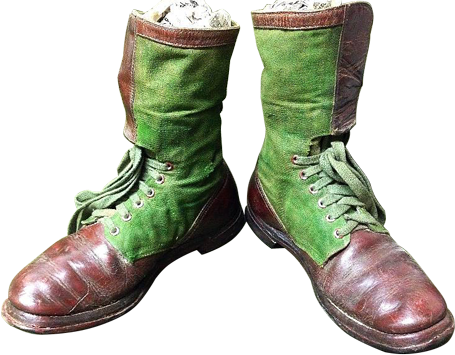 (1) The boots should be worn with one pair of wool cushion-sole socks and one pair of ventilating insoles. Additional socks may cramp the feet and interfere with proper blood circulation. (2) The boots should be pulled on and the heel seated firmly into place. 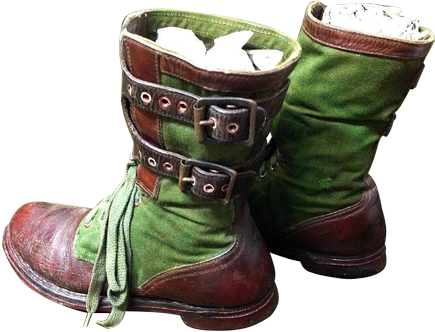 The boots should fit snugly but not tightly with the cuff buckled and the laces securely tied. (3) Socks should be changed at least once a day; more often if necessary. The feet should be dried and massaged whenever socks are changed. This practice is necessary to prevent jungle rot. Note. The term "jungle rot" applies to any of a number of infections that occur when the skin remains warm, wet and chafed over a period of time. Such skin conditions frequently cause casualties and require months of medical treatment and convalescence. (4) The ventilating insoles should be removed and replaced whenever socks are changed. They may be washed and dried for future use. (5) The insides of the boots should be carefully inspected and cleaned before boots are put on in insect-infested areas. c. Care. The service life of boots can be prolonged by proper care. They should be washed frequently and dried in the shade or dim sunlight. They should be inspected frequently for damage from any source and turned in for repair as needed. Mud or excessive dust should be brushed off when washing is not practicable. Wax shoe polish should be applied if the leather is dry. The insides of the boots should be wiped with a moist soapy cloth, whenever possible, and air dried. Note. Boots should never be stored or put aside when they are muddy or wet. Wet or muddy boots should never be placed near direct or intense heat.